Edmund Booth was born in 1810 and died in 1905, and during the 94 years of his life, he epitomized virtually everything that characterized an American legend of that century. In his prime, Booth stood 6 feet, 3 inches tall, weighed in at 210 pounds, and wore a long, full beard. He taught school in Hartford, CT, then followed his wife-to-be Mary Ann Walworth west to Anamosa, Iowa, where in 1840, he built the area’s first frame house. He pulled up stakes nine years later to travel the Overland Trail on his way to join the California Gold Rush. After he returned to Iowa in 1854, he became the editor of the Anamosa Eureka, the local newspaper. Edmund Booth fit perfectly the mold of the ingenious pioneer of 19th-century America, except for one unusual difference — he was deaf. Edmund Booth: Deaf Pioneer follows the amazing career of this American original and his equally amazing wife in fascinating detail. Author Harry G. Lang vividly portrays Booth and his wife by drawing from a remarkable array of original material. A prolific writer, Booth corresponded with his fiancé fromthe American School for the Deaf in Hartford, and he kept a journal during his days on the California trail, parts of which have been reproduced here. He also wrote an autobiographical essay when he was 75, and his many newspaper articles through the years bore first-hand witness to the history of his times, from the Civil War to the advent of the 20th century. Edmund Booth depicts a larger-than-life man in larger-than-life times, but perhaps its greatest contribution derives from its narrative about pioneer days as seen through Deaf eyes. 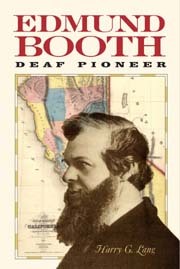 Booth became a respected senior statesman of the American Deaf community, and blended with his stories of the era’s events are anecdotes and issues vital to Deaf people and their families. His story proves again that extraordinary people vary in many ways, but they often possess a common motive in acting to enhance their own communities. Harry G. Lang is Professor Emeritus at the National Technical Institute for the Deaf at Rochester Institute of Technology.